Does anyone know what this is? It's only 2 inches (50mm) tall at present, and germinated in a pot which was supposed to (and indeed did) contain seeds of Diplosoma retroversum from Mesa Garden. The seeds were sown in Autumn 1998 and apart from several Diplosoma, I got this plant, which I assumed was an annual 'weed' from the Mesemb. family. It died down in the Spring, along with the Diplosoma, and I assumed it was dead. 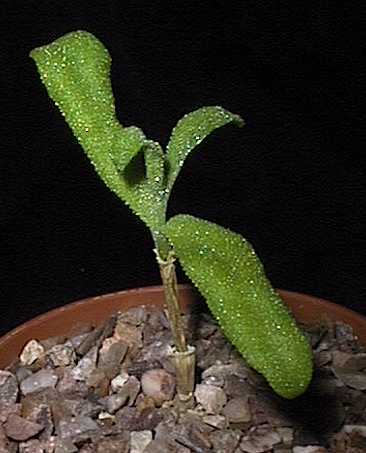 But on transplanting the Diplosoma in Autumn 1999, I found that the mystery plant had a small round tuber, and that there was a potentially still living tiny dormant bud at the top of its thin stem. Sure enough, it has now started to grow again (see below). Here you can see how it has developed by February 2000, during its second (Winter) growing season. It has now reached 50cm tall and has small purple flowers (which seem reluctant to open). 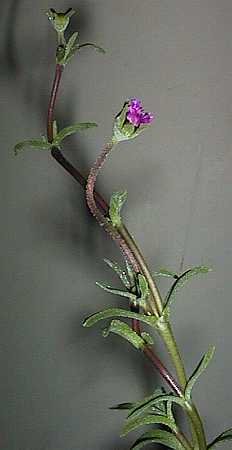 There is still only one main stem (top 15cm in the picture) though it has short side-shoots in the leaf axils all the way up. 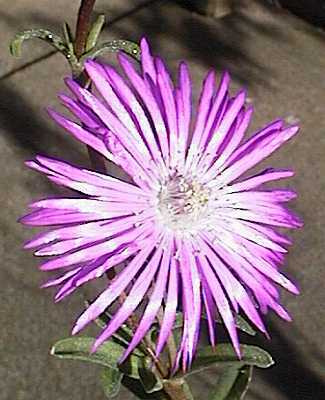 At last, March 4 2000, the sun has persuaded the flower to open!